Searching for Bonobo in Congo » How Many Elephants Are Left in D.R. Congo ? Elephants in D.R. Congo. Where they still are and where they might be. The Remaining elephants: What do we know?? note: all references for any one site do not give same estimation due to differences in area covered, methods used and time of census. In such cases, we used most recent and complete or we combined observations. 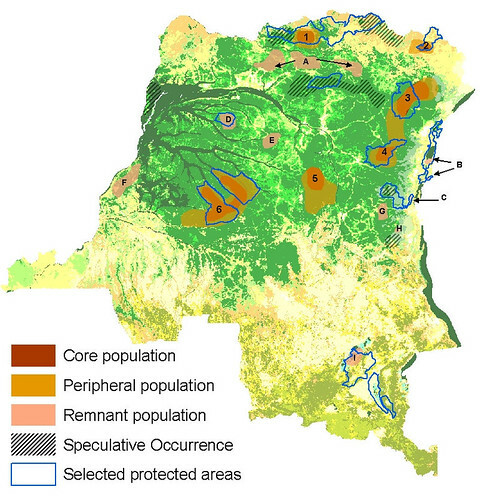 Only 6 core populations (≥ 500 elephants occupying contiguous range) remain in DR Congo. All of these core populations, except TL2 , are in a protected area. All of these core populations are under poaching pressure. All of these core populations have decreased in the last 10 years, some catastrophically. We know of nine remnant populations (< 500 elephants, often less than 50 remain). Others are possible. 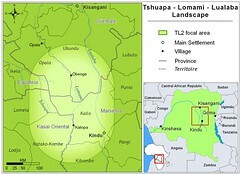 Four remnant populations are within protected areas (Virunga, Upemba, Kahuzi Biega, Lomako). How fast are the elephants going? * this was not an exhaustive survey due to continued rebel presence, but the complete lack of elephant sign is ominous. The size of only a few populations, shown above, was known before the war from either aerial counts or ground inventories. Only savanna populations for which aerial counts were possible had even earlier, pre-1980 information (Garamba and Virunga). CONCLUSION: Total DRC elephant population is likely under 20,000, and still dropping. This is down from a population estimated at over 100,000 elephants 50 years ago. Please, send any recent observations: sightings, surveys, poaching. Also if you have historical information or a good source not mentioned below, please let us know. As of noon 1 February 09 this post has already been updated once. Thank you Rene and Jose! Our next elephant post will explore possible strategies to secure D.R. Congo’s elephants. Send your ideas. 1. Alers, M.P.T., Blom,A., Sikubwabo, K., Masunda, T. and Barnes, R.F.W. !992. Preliminary assessment of the status of the forest elephant in Zaire. African Journal of Ecology 30, 279-291. 2. Aveling, C. 1990. Comptage aérien total des buffles et éléphants au Parc National des Virunga. Octobre 1990. Programme Kivu ; sous-programme Virunga. 6. de Merode, E. I. Bila, J. Telo, G. Panziama. Aug. 2005. An aerial reconnaissance of Garamba National park with a focus on northern white rhinoceros. Technical report to ICCN and the European Union. Further technical input from ACF and WWF-CARPO staff. 8. Grossmann, F., J. Hart & S. Dino. (2006) Réserve de Faune à Okapi : Post conflict baseline surveys. 2005. Central Sector “Zone Verte” Unpubl. Report. WCS. 9. Hall, J.S., Bila-Isia,I., Williamson, E.A., Ilambu, O, Sikubwabo, K., White L.. 1997. A survey of elephants (Loxodonta africana) in the Kahuzi-Biega National Park lowland sector and adjacent forest in eastern Zaire. African Journal of Ecology 35 : 213-223. 10. Hart, J.A. and Hall, J.S. (1996) Status of eastern Zaire’s forest parks and reserves. Conservation Biology 10 : 316-324. 11. Hart, J., R. Beyers, F. Grossman, M. Carbo, S. Dino, F. Kahindo. April 2008. La Réserve de Faune à Okapis: La distribution et fréquence de la grande faune et des activités humaines. Unité d’Inventaire et de Monitoring. IMU Technical Report No 9. WCS- DR Congo Program, Kinshasa. 13. Hart, J. A. 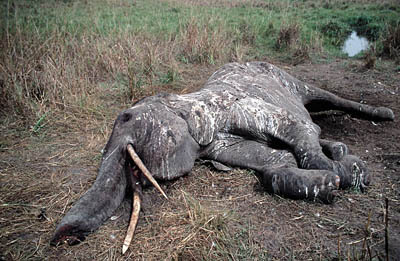 (2006) Resource Wars and Conflict Ivory: Depletion of DR Congo’s Elephants: 1996-2006. Unpubl. ms.
16. Hillman Smith, A.K.K. (2001) Status of northern white rhinos and elephants in Garamba National Park, Democratic Republic of Congo, during the wars. Pachyderm 31 :79-81. 22. Kujirakwinja, D., A. Plumptre, D. Moyer, et N. Mushemzi. 2006. Parc National des Virunga. Recensement aerien des grands mammifères, 2006. Institut Congolais pour la Conservation de la Nature, Wildlife Conservation Society, US Fish and Wildlife Service. 24. Matunguru, J. 2007. Rapport de mission sur le suivi des éléphants effectuée à Kabaraza du 17 au 19 mai 2007. Wildlife Conservation Society. PN Virungas . Unpublished field report. 26. Vanleeuwe, Hilde. 2008. Large mammals and human impact survey : Upemba & Kundelungu National Parks. DR Congo. USFWS, WCS. This entry was written by Terese Hart, posted on 2009-02-01 at 1:17 am, filed under Elephant. Bookmark the permalink. Follow any comments here with the RSS feed for this post. Post a comment or leave a trackback: Trackback URL. Publishing such data can be used both positively and negatively. It also alerts those who wish to know where to locate elephants for their own ends. Is it not better not to make such information public knowledge. Alas, we get alerted to where elephants are only too often secondarily because of poaching activity. The internet is not the source of information for those that are doing the poaching. Local police and military learn from villagers and local hunters where elephants are and it goes up the chain. Elephants have dropped from more than 100,000 to under 20,000 in DR Congo without any help from the internet. On the otherhand, the internet is widely used by people who can, we hope, use this information to the benefit of Congo’s forest elephant…. Thank you Michael for this alert. We will try to get this report, and update the map and references. We are hoping that this sort of “filling in of the map” will provide a basis for a call to action. Can comments be made in French ? Oui, bien sûr. En principe on devrait écrire en anglais et en français mais — et veuillez me pardonnez — ça nous dépasse! vous voyez: j’aurai dû dire “veuillez me pardonner”, n’est ce pas! I’m heading back to the region this coming Wednesday and am happy to pass on any additional information I find. Very interesting and do keep us updated. We are collecting corrections and additions and will plan to update at least a week before the CoCoCongo (March 12) — will you be able to get us an update by early March? Absolutely. I should be back from this trip by the end of February if all goes well (our main goal this go-round is collecting chimp faeces) and will hopefully have something for you long before your deadline. I’ve seen your materials tru one of our local news site, realitatea.net and we are, really, terified knowing that the elephants are killed, that our kids will not have posibility to see those animals in the natural environment. I consider your work as something great and I will follow your info, hoping that this will change something ! Many areas of terra firmae în the map were not checked on land by anyone, on one hand, and all the swamp forests were never brought în discussion, on the other hand. Previous estimate (cca 100,000 more than 50 years ago) are just a guess like the actual estimate (cca 20,000 at present day). This is the reason why no one really know how many forest elephants are left in cca 1 million square kilometers of rainforest! All the scientist may estimate only how many elephants exist today în the protected areas (and here the number of 20,000 individuals look more likely to be real).